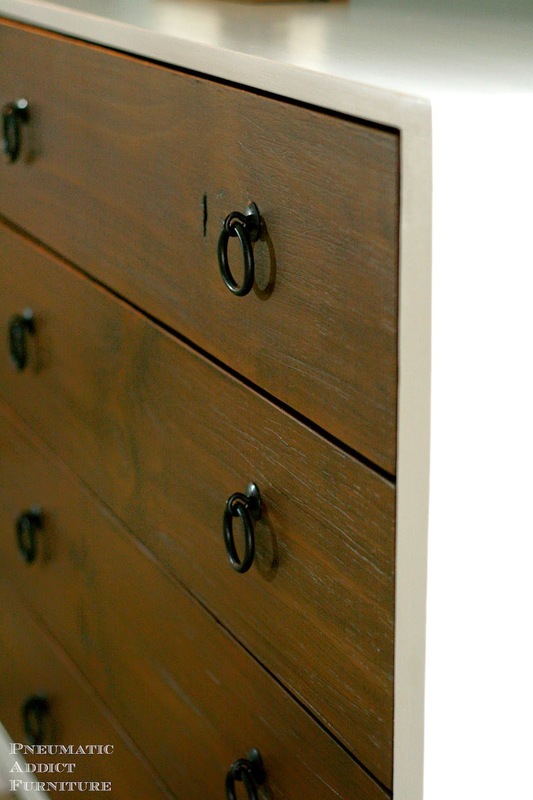 Last week I shared my Jordan dresser knock-off with you, and I promised to show you how I got the textured, raised grain look on the drawer fronts. If you like the texture of old weathered wood, but don't have any of the real stuff laying around. no worries. I made my drawer faces from off the shelf 1 x 8's. A few simple steps make a big difference. You can find dozens of tutorials on Pinterest for a "weathered" or "driftwood" finish for wood (heck, I have one too). The problem is, they have the color right, but there is more to old wood than a grey-ish tone. Adding texture definitely amps up the "old" factor. This tutorial assumes you're working with raw wood. If you are working on an existing piece of furniture, I would suggest stripping off any previous finish first. Grab a spray bottle and fill it with warm water. Good ole' tap water will do. Nothing special. 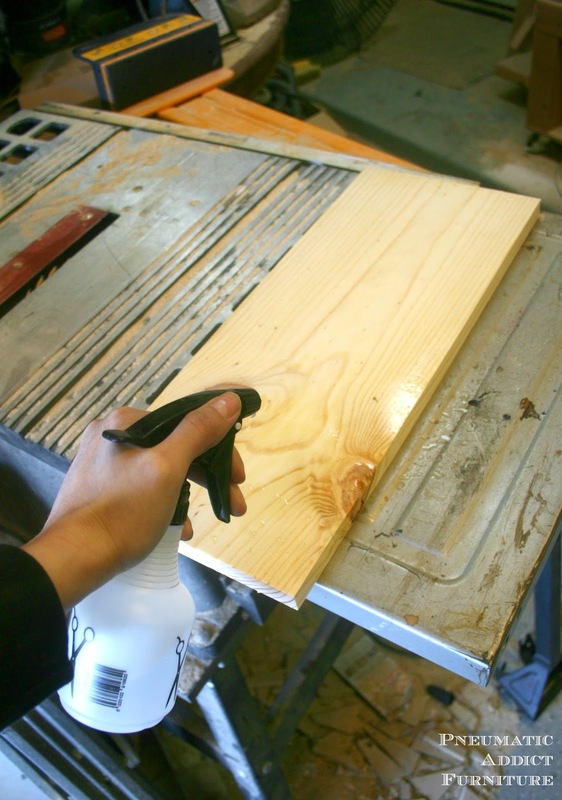 Spray down the board till the whole surface is saturated. Let it rest for a few minutes; just the moisture from the water will start to raise the grain. Next, grab a rack of nails. These are the nails you use in a pneumatic nail gun. The gauge doesn't matter too much, but you want full size nails, not brads. 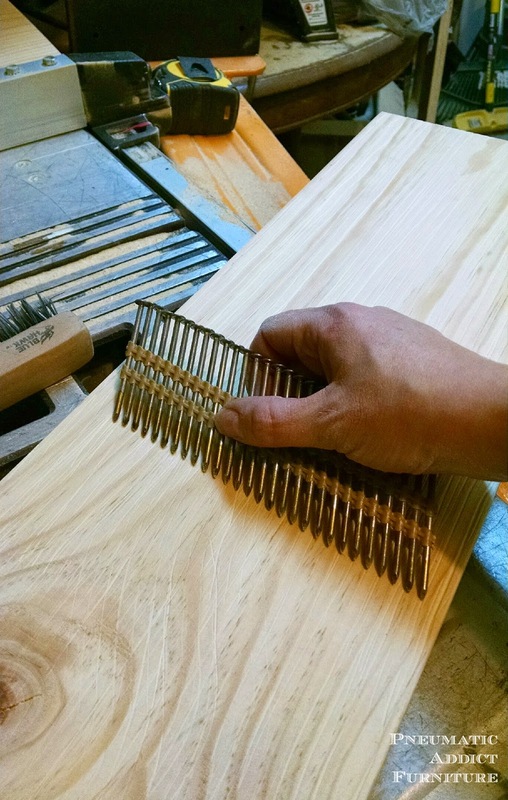 Start on one end of the board, lean the rack at a steep angle, and drag heavily, following the grain. If there are knots or swirls, trace along them. Make several heavy passes. Don't have a rack of nails? No biggie. Pound some nails halfway through a scrap board and use that. And that's is! 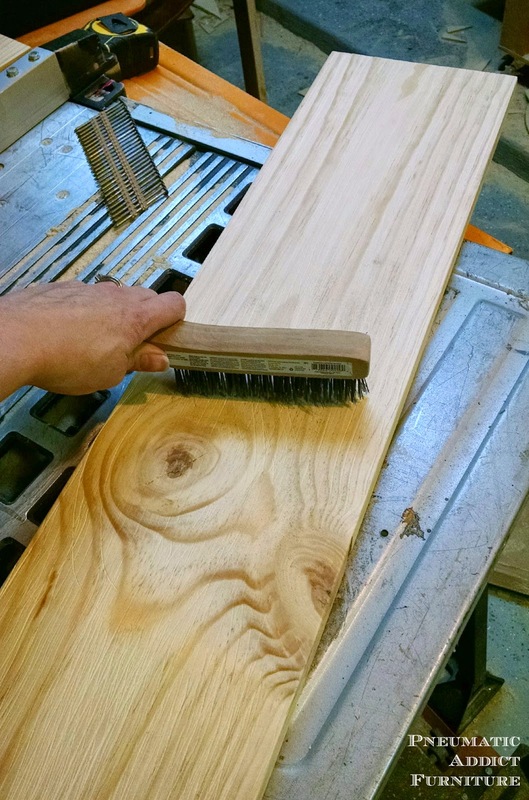 Allow the board to dry completely, then finish however you'd like. 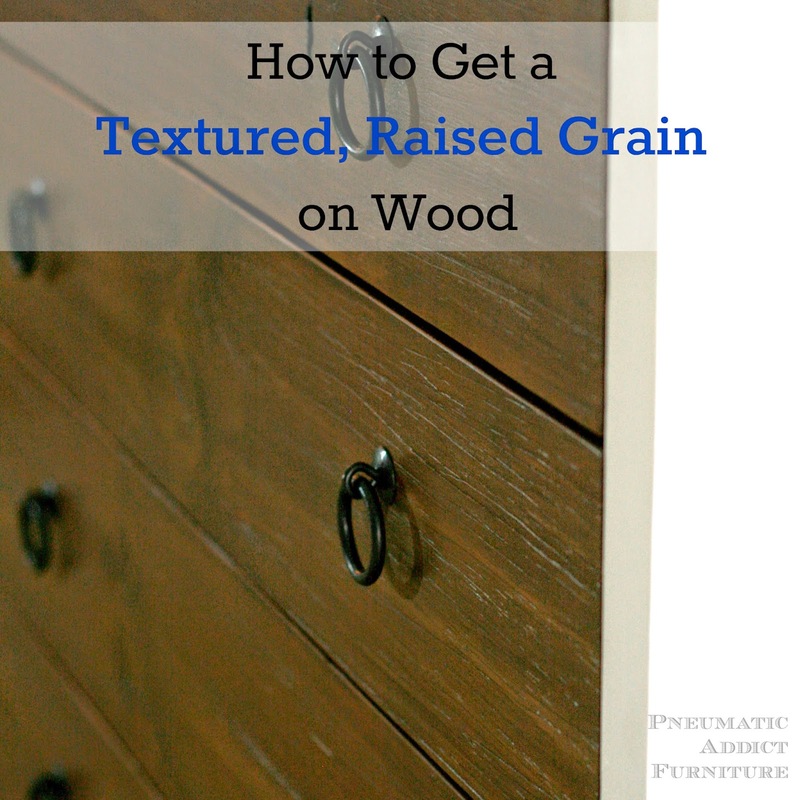 Whatever color you go with, you'll have a great, raised grain texture. That really is beautiful! I have a couple of pieces I would love to refurbish. This would be great! Genius! I've been looking for a technique to address the texture aspect of aged wood and you're the first person who "gets it"-- it's not just color! 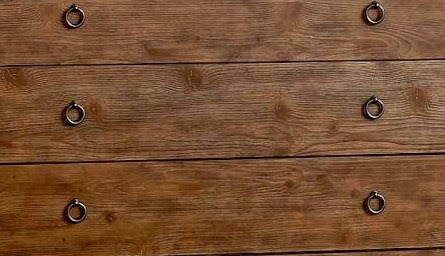 Aged wood gets a scruffy, bristly look from the swelling and fraying of the grain that coloring alone just doesn't capture. Thanks! I once used a product called roto-stripper. It is a device used with an electric drill. It has numerous metal tines extending from the hub each of which has freedom to move independently and will 'fold back' under pressure. The result is that your work surface is struck 1000's of times with these metal tines with a generally consistent force. Years ago, I refinished a very old (circa 1910) staircase made with pine treads. The hard portions of the grain remained, while the softer inner portion were scraped away. After conditioning the treads in this way, Sanding away any big 'hairs', and finishing with multiple clear coats it was done and looked great. I've seen wire strippers like that before and I've been dying to try one! Thanks for the tip! Just attach a wire wheel to electrical drill and pass it along the grain following by light sanding.